On January 19th, Luke and his sibeling Dora made their way to MaPaw foster homes. We had originally been contacted by the shelter where they were residing because both pups were quite shy and the shelter felt rescue would be their best chance. We were making arrangements to bring the pair into rescue when we got the call we were dreading ~ the shelter had an emergency and needed Dora and Luke out immediately. Our volunteers sprung into action and soon were on their way to pick up the pair. When our volunteers picked them up, it was clear that Luke was quite ill and he was taken for immediate vet care. Our worst fears were realized when his breathing became labored. He was rushed to emergency care and admitted immediately. Chest x-rays revealed that our poor boy suffered from pneumonia. IV fluids and several antibiotic injectables were administered. Finally the update from the hospital was good news. 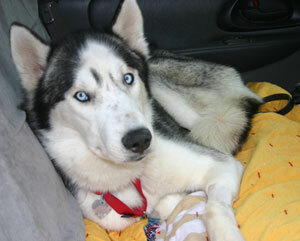 Luke no longer had a fever, no longer had difficulty breathing and the best news ~ he could return to his foster home! His appetite has returned and he is now resting comfortably at his foster home. Luke is being spoiled in his foster home and his subsequent chest x-ray was clear. He will continue with his recovery and once he receives a clean bill of health, he will be ready to go to a forever home. So sadly, our Dora left us far too soon. We are so very grateful for the short time we had with her and that she knew love and that people cared for her before she left us so quickly. Any donations and contributions toward Luke’s medical bills are gratefully appreciated.